While visiting Princeton next week, Dr. James L. Green, director of the National Aeronautics and Space Administration’s (NASA’s) Planetary Science Division, will give an overview of planetary science exploration during the last five decades in a talk titled “The Revolution in Planetary Science” at the regular monthly meeting of the Amateur Astronomers Association of Princeton (AAAP) on Monday, February 4, at 8 p.m. in Peyton Hall on the Princeton University Campus. The Planetary Science Division that Mr. Green leads is responsible for missions from Mercury to Pluto. The planet Mars has been the subject of particular attention in the last several years leading up to the landing of the Curiosity rover. Speaking for the AAAP Secretary, Michael Wright said that he was delighted that Mr. Green was able to speak to the association. As director of NASA’s Planetary Science Division since 2006, Mr. Green is eminently qualified to discuss the latest solar system discoveries. Since he received his PhD in space physics from the University of Iowa in 1979, he has headed several data centers responsible for providing scientists with rapid access to data, other scientists, and NASA computers, and information. Mr. Green began his professional career working in the Magnetospheric Physics Branch at NASA’s Marshall Space Flight Center (MSFC) in 1980. At Marshall, he developed and managed the Space Physics Analysis Network that provided scientists all over the world with rapid access to data, to other scientists, and to specific NASA computer and information resources. In addition, Dr. Green was a safety diver in the Neutral Buoyancy tank making over 150 dives until left MSFC in 1985. From 1985 to 1992, he led NASA’s largest space science data archive, the National Space Science Data Center at Goddard Space Flight Center (GSFC). While at the Goddard Space Flight Center, Mr. Green was a co-investigator and deputy project scientist on the Imager for the Magnetopause-to-Aurora Global Exploration (IMAGE) mission. 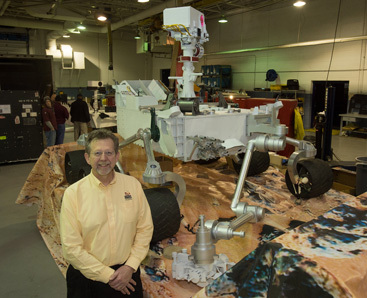 At NASA, he is responsible for solar system exploration at a time when recent planetary science missions have been successfully ventured or completed, including the launch of Juno and Jupiter, and the landing of the Mars Science Laboratory and the Curiosity rover on Mars. The author of over 100 scientific articles about the Earth’s and Jupiter’s magnetospheres and over 50 technical articles on data systems and networks, he has received numerous awards including the 1988 Arthur S. Flemming award for outstanding individual performance in the federal government and Japan’s 1996 Kotani Prize in recognition of his international science data management activities. You may have seen him in the PBS NOVA special Finding Life Beyond Earth. Last June, the American Astronomical Society presented him with the distinguished 2012 Popular Writing Award for his contribution to the article “The Perfect Solar Superstorm,” published in the February 2011 issue of Sky & Telescope. Not only is Mr. Green an accomplished scientist and communicator, he is a student of the American Civil War with a special interest in ballooning. It seems that during the war, balloons played an important role in map-making, artillery-spotting, and the observation and reporting of troop movement. Founded in 1962, the Amateur Astronomers Association of Princeton currently has over 80 members with interests in all aspects of astronomy and space science. The organization promotes a wide range of astronomy-related activities including: solar, planetary, and deep-sky observing, astro-photography, star parties, lectures, and education. It owns and operates two observatories in New Jersey, one at Washington Crossing State Park and one at Jenny Jump State Park. The AAAP, which hosts public observing at its observatory in Washington-Crossing State Park, Titusville, from 8 p.m. to 11 p.m. (weather permitting) on Fridays from April to October, holds public lectures on the second Tuesday of each month in Princeton. The speaker to be featured on March 12, will be author Michael Lemonick. Admission to the lectures is free and the public is welcome. Free parking is available across the street from Peyton Hall. For more information, including directions, visit: www.princetonastronomy.org.